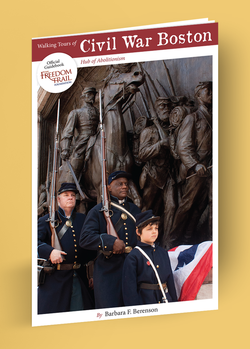 An official guide of Boston’s prestigious Freedom Trail Foundation, Walking Tours of Civil War Boston is a full-color, 64-page booklet packed with contemporary and historical pictures and inspiring stories. Three self-guided walking tours and one harbor tour explore 42 centrally-located sites in the city where the Civil War really began. These sites include Massachusetts State House, Faneuil Hall, the Park Street Church, the African Meeting House, the 54th Regiment Memorial, the Soldiers’ and Sailors’ Monument and many more. This engagingly written booklet will bring to life the brave abolitionists who were determined to honor the American Revolution’s legacy of liberty by abolishing slavery throughout the nation. Purchase Walking Tours of Civil War Boston: Hub of Abolitionism from The Freedom Trail!